This product was made so we teachers have a excellent excuse to practice decimal operations during the month of March! I made it with my 5th graders in mind because I could not find too many coloring or cut/paste math worksheets for their level. They’ve told me how they love all the coloring we do in math! 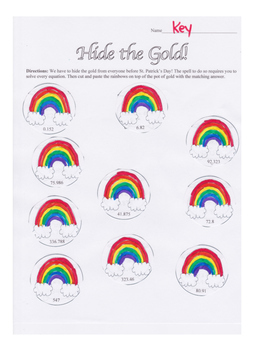 The first worksheet, “Find the Gold”, has the rainbow half sheets that go with it. Students will have to use all four operations using decimals with that worksheet. Just copy one worksheet for every students, then copy half that amount of the rainbow worksheet. Cut the rainbow worksheet in half, and give each kid a half. “Gather Lucky Charms” has students practice adding and subtracting decimals. “Found a Leprechaun” has students practice multiplying and dividing decimals. 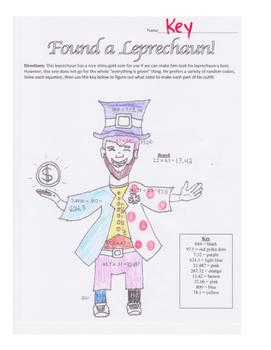 Students can color any part of the leprechaun that does not have an answer in it whatever color they choose. Perfect for stations or as review. 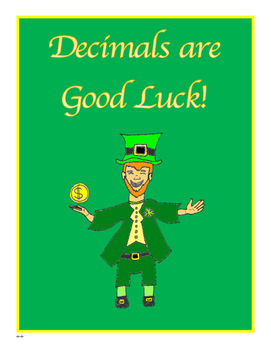 Please check out my other holiday themed decimal worksheets that can help you review decimals all year round!